PRESS RELEASE: This new 70 amp Hot Shot rectifier regulator is built using Mosfet Technology, allowing the regulator to run cooler & more efficiently. Rick’s worked with RZR owners to upgrade their original design, using a 70 amp unit that is the biggest & baddest one on the market. The Rick’s Hot Shot regulator is protected by a separate inline 50 amp water resistant fuse. If the rec/reg gets too hot & is going to short out, the fuse will blow, stopping all the current from getting to the rest of the charging system. This is an improvement over the OE version that only has a thermal switch. That switch shuts off the rec/reg if it gets too hot & the ATV won’t even charge until it cools down! “Our customers are one of our biggest resources,” says company president Rick Shaw. 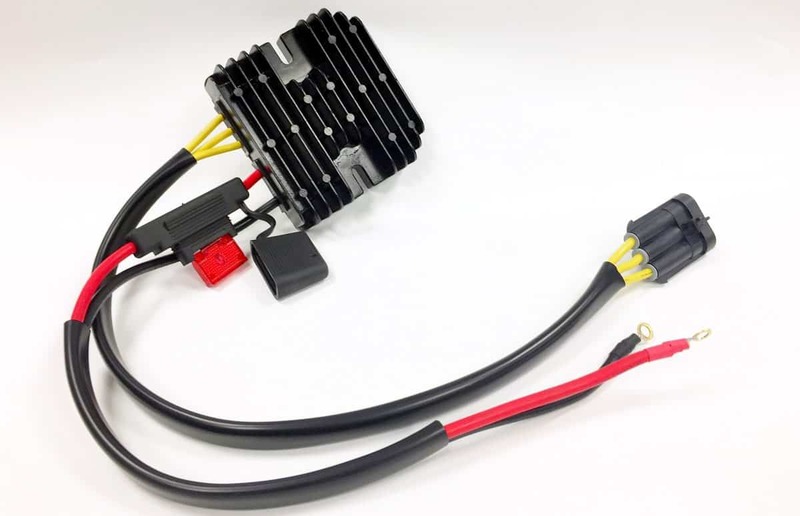 “We wanted to give them the best value for their investment so that’s why we increased the amperage on our new design.” As added insurance, all of Rick’s Motorsport Electrics rectifier regulators come with a one year replacement warranty. The voltage regulator is a key element in the RZR’s charging system. Without it, the battery doesn’t change and you are dead on the trail. It’s always a good idea to keep a spare unit in your tool box so you’re never stranded on the trails. Many RZR owners add additional accessories to their machines. The OE service manual gives the rated alternator output of 560 watts. It should be noted that this is the number for an ideal system; real-world applications will likely be lower. When attempting to determine the maximum amount of current draw that can be added to your system we strongly recommend reading the “Charging System Break-Even Test” found in the electrical section of your OE Polaris service manual. This will tell you if the charging system is able to keep up with your accessories and keep the battery charged. If your vehicle fails this test it means you are running too much and your system will not be able to keep up.